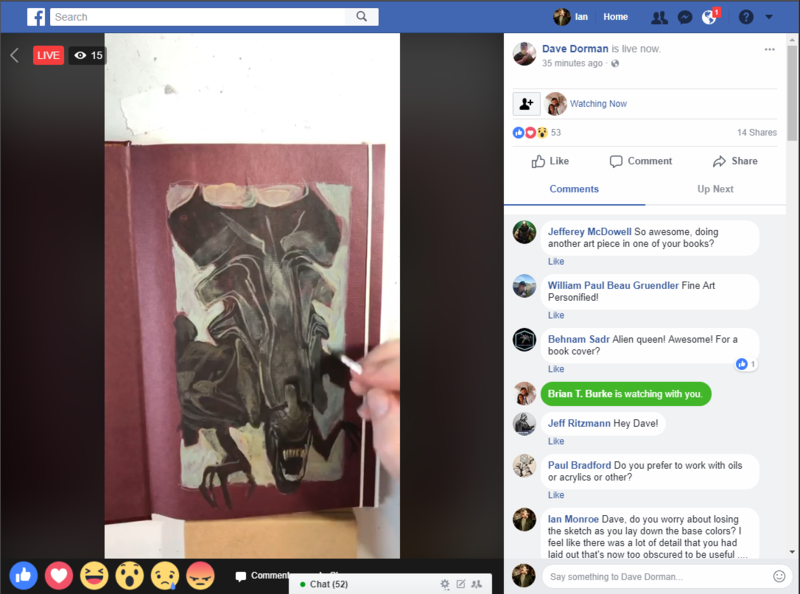 The well-known fantasy artist Dave Dorman paints an Alien queen live on Facebook. Lately, one of my favorite things to do is to check out art demo videos on the internet. It’s always fascinating to watch someone who’s an expert at something do their thing in real time, particularly in creative pursuits. Often, when a person encounters a work of art, it’s in the context of a final, finished work. Perhaps it hangs in a gallery, or appears on a book cover, or perhaps in a magazine or in an advertisement. And of course, I always enjoy seeing finished works. But it can obscure the fact that reality has a surprising amount of detail, and just having a look at the finished work (particularly if it’s a reproduction, and not the original) doesn’t reveal the process by which the work came to be. Why did they make this decision? How did that detail get made? Where were the mistakes or the false starts? When I was a kid, the only time you’d ever get to see artists actually producing work was if you took a class, or you watched Bob Ross (or his many imitators) on PBS. Thankfully, in this day and age, we can often get a much richer experience of an artist’s creative process. Painting not your thing? Why not check out a sculpture video? 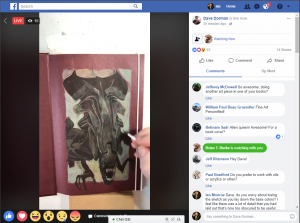 Maybe you’d like to hear the artists talking about the techniques as the work unfolds? Perhaps there is a particular style or artist you are fond of, and you’d like to learn more about how they made their works. No matter what kind of art you’re into, there’s someone making videos showing off how they do it. That’s why it’s become one of my favorite ways to spend some time; you can get art lessons from all across the world, in any style or medium you like, at a moment’s notice. The whole world is your art teacher. Oh, man, I wish there was some kind of portable rig for this kind of thing. So interesting. I’ve got the perfect spot for that. If I were in Los Angeles, I’d go to this. Everything looks better in time lapse mode. A beautiful video featuring a whole bunch of great time-lapse footage from around the world, via reddit. 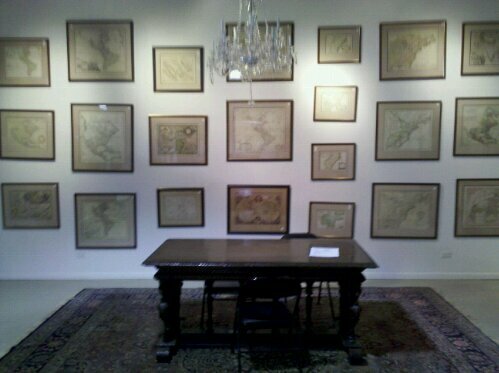 Here we see maps hung in the preview room before our rare books and manuscripts auction. Nice display, eh? 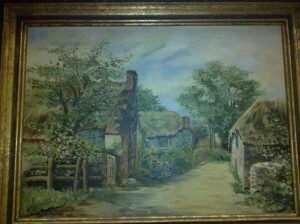 I recently acquired two small oil paintings in an auction. I paid very little for them. They’re nice enough paintings, and certainly a deal for how little they cost, but they’re not exactly in the style of my home decor. So naturally, I got to thinking, maybe a fun thing to do would be to use these paintings as raw material; as the basis for a couple of collage pieces. For instance, I could use digital images of the paintings, and construct layers in photoshop which could then be applied physically to the canvasses themselves. Many visual collages are based on reproduced images, such as pictures or typography from magazines. But to use a one-of-a-kind painting as the base layer raises some interesting ethical, aesthetic, and value questions which collages based on mass-produced media do not. Namely, is it right to destroy, for all practical purposes, the original work to build a new work from it? Now, I know that legally, objectively, since I own the canvas, it’s mine to do with as I please. However, these are works that someone created at some point in the past, a part of the legacy of another human. Part of the value of these works is that they are old(-ish); they’ve survived in their present form since their inception. Just watch Antiques Roadshow — don’t clean it, the patina is part of the value, it’s in the original frame, et. al. There is a tradition in Asian art where the owner of a work of art adds his stamp or signature to the work upon acquiring it. 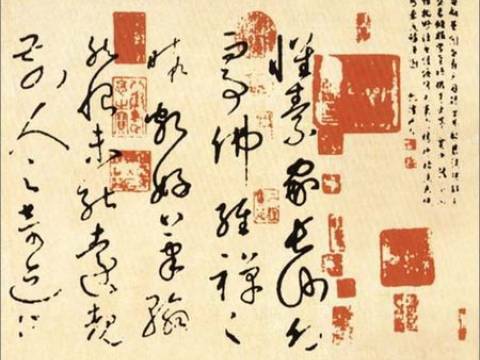 By this method, the provenance of a work is preserved as part of the work itself. Part of the value, part of the story of the painting or scroll is found in the history of its ownership. I mentioned this to a friend the other night in an instant message conversation, and she brought up some good points. Her: but it does make one wonder what the focus is, there. the prestige of ownership of something fine or expensive? Me: I think that all those are valid. perhaps it was a melange. Her: but again, the owner can do as the owner chooses. the difference is that in our culture, it’s frowned upon to alter the original work for something that’s basically a record-keeping measure. Me: do you think there’s a good argument why one school of thought should be preferrable to the other? Her: not really. I think cultures vary, and there are much bigger issues at stake there. She’s right, of course. In the West, there is a taboo against a subsequent owner altering a work of art. There’s an unspoken rule that those who own artworks have a responsibility to preserve them in the same condition in which they acquired them. So do we have a duty to preserve the art and artifice of those who went before us? To what degree? As I’ve been thinking, it occurs to me that there are a number of factors to consider for any particular work. The only reason I’m considering modifying these particular works is because I got them so cheaply. I’d be way, way less likely to modify a $10,000 painting than I am a $10 painting. 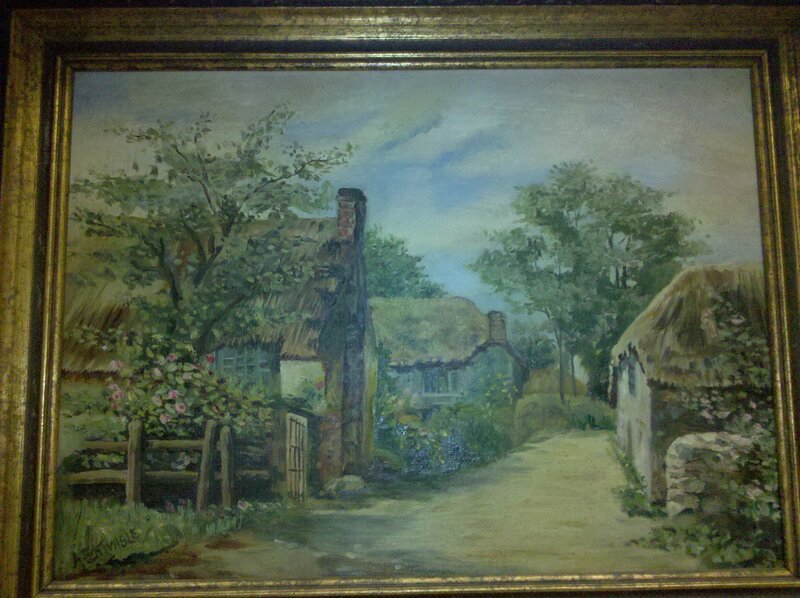 I wouldn’t modify a painting by a “name” artist like Picasso or something. I mean, it’s priceless as it is; I would be adding no value. However, I can imagine a world in which my modifications to an existing work might add value, as in the case of my little pieces — they would cease being relics, and would be re-inserted in to the dialog of modern art by the very act of being modified. I wouldn’t modify the work of a still-living artist. Even if I own it. After all, those folks might still like to refer back to the work for, say, a retrospective or something. If the artist is still alive, isn’t right that they should have final say about how the image or work should look? 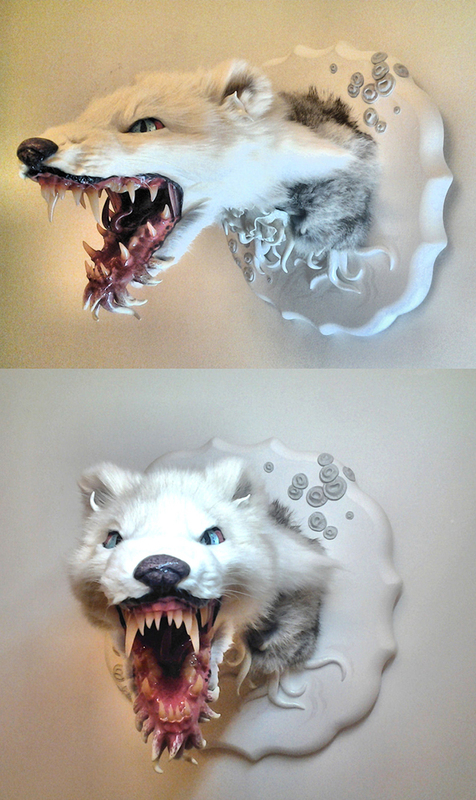 If someone else bought a painting I had made, and then chose to modify (or destroy) it, I would have mixed feelings. On the one hand, I think I should get the final say or at least first right of refusal. On the other hand, it IS their property, so why should I get any input on it at all? That’s part of the risk you take when you release a singular, one-of-a-kind piece out into the big, wide world. And what about the idea that if I WERE to buy and then modify some really expensive or important work, couldn’t I spin that in such a way as to interject myself into the conversation of art history? My name would be associated permanently with the original artist. My work would co-opt some legacy, and would instantly become something more than simply a mere work of visual art; it would be a piece that required a huge sacrifice to pull off at all. It would be more famous by virtue of being both a destruction and a creation. So, dear readers, I put it to you then: What do you think? Should I try the experiment and modify my little paintings? Should I leave them be? Do I have any moral obligations either way? Post in the comments, and let me know what you think. The _____ of _____ mentioned in Orlando Weekly! Wowee! My old friends published a mention of my book, along with a mini-interview, in this week’s Happytown column! Not a day goes by in which someone doesn’t ask, “Hey, Happytown™, whatever happened to that Ask Ian the I.T. Guy? He sure had a nice ponytail.” In an effort to satiate Orlando’s thirst for information on our former I.T. guru and columnist, Ian Monroe, we tracked down the man himself and found him with a newly minted degree from the Medill School of Journalism in Chicago and, more exciting still, a new book! It’s called The ____ of _____ by Means of Natural _____, which probably needs a tiny bit of explanation. 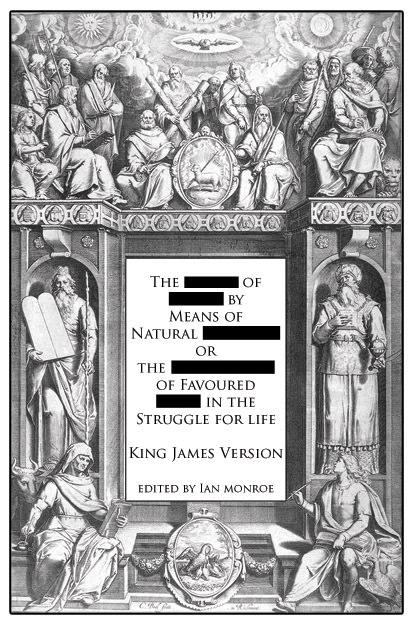 See, Monroe, ever the intellectual prankster, “cleaned up” Charles Darwin’s masterwork, The Origin of the Species by Means of Natural Selection, for evangelical Christians by redacting every word in Darwin’s book not also found in the Bible. Now even Baptists can read about evolution without risking their immortal soul! Thanks Ian! Here’s our tiny little interview with Monroe. For more information on the book check his website at www.ianmonroe.com. Happytown™: Aren’t you making fun of Jesus and thus risking eternal damnation? Monroe: On the contrary, Jesus is never mentioned in the Origin of Species. If he were, I assure you, he would retain his rightful place as lord of lords within my King James Version as well. Happytown™: Is it possible to still glean important concepts from Darwin’s work after running it through your Jesus sieve? Monroe: Not really, no. It’s pretty unreadable. However, I did learn some interesting things about the Bible while I was working on it. For instance, did you know that unicorns are mentioned in the Bible twice? That makes them more real than the entire continent of South America, which didn’t even appear once. Happytown™: Are you planning to do the same for other great works of science? Monroe: Darwin was particularly well-suited to analysis through a biblically correct lens; I imagine that most modern science would yield even more redactions. However, I invite readers to “correct” their own texts with the interactive Bible masher on my website, ianmonroe.com/bibleizer/. How do you find out who are the sharpest, most creative designers in the world? With a good, old-fashioned, graphic design battle, of course. The 2009 Cut & Paste Digital Design Tournament pitted the best graphic designers against one another in a competition like no other. Armed with state-of-the art computers, designers squared off on the stage of the Congress Theater on Saturday to determine who would represent Chicago in the global finals to be held in June in New York. This story was first published on the Medill Reports website on 4/7/2009. Republished here for my own archives.